spadadot writes French-based startup has just launched a website that will let you add your skills to a comprehensive map of human skills. As quoted from their website "We aim to build the largest, most accurate, multilingual skills database ever made, by allowing a diverse and skillful community to contribute their individual skills to the global map." The ontology is simple: skills can have zero or more sub-skills. Every new skill is available in all supported languages (only English and French at the moment). The crowdsourced data is free for non-commercial use." An anonymous reader writes AT&T says it will halt its investment on broadband Internet service expansion until the federal rules on open Internet are clarified. "We can't go out and just invest that kind of money, deploying fiber to 100 cities other than these two million [covered by the DirecTV deal], not knowing under what rules that investment will be governed," AT&T Chief Randall Stephenson said during an appearance at a Wells Fargo conference, according to a transcript provided by AT&T. "And so, we have to pause, and we have to just put a stop on those kind of investments that we're doing today." Lucas123 writes Backblaze, which has taken to publishing data on hard drive failure rates in its data center, has just released data from a new study of nearly 40,000 spindles revealing what it said are the top 5 SMART (Self-Monitoring, Analysis and Reporting Technology) values that correlate most closely with impending drive failures. The study also revealed that many SMART values that one would innately consider related to drive failures, actually don't relate it it at all. Gleb Budman, CEO of Backblaze, said the problem is that the industry has created vendor specific values, so that a stat related to one drive and manufacturer may not relate to another. "SMART 1 might seem correlated to drive failure rates, but actually it's more of an indication that different drive vendors are using it themselves for different things," Budman said. "Seagate wants to track something, but only they know what that is. Western Digital uses SMART for something else — neither will tell you what it is." Sez Zero writes with news about the latest from Amazon Web Services. "Once again Amazon Web Services is taking on Oracle, the kingpin of relational databases, with Aurora, a relational database that is as capable as 'proprietary database engines at 1/10 the cost,' according to AWS SVP Andy Jassy. Amazon is right that customers, even big Oracle customers who hesitate to dump tried-and-true database technology are sick of Oracle’s cost structure and refusal to budge from older licensing models. Still there are very few applications that are more “sticky” than databases, which after typically contains the keys to the kingdom. Financial institutions see their use of Oracle databases as almost a pre-requisite for compliance, although that perception may be changing." Daniel_Stuckey writes A London-based programmer has set up a new hidden service for anyone using Tor to submit anonymous tips to the FBI. With the new .onion hidden service link, which accesses the FBI's tips page through a reverse proxy, Mustafa Al-Bassam told me in an IRC chat that he's engineered a "proof-of-concept," demonstrating how the bureau might go about setting up a more secure system for receiving crime tips. KentuckyFC writes During the Chinese New Year earlier this year, some 3.6 billion people traveled across China making it the largest seasonal migration on Earth. These kinds of mass movements have always been hard to study in detail. But the Chinese web services company Baidu has managed it using a mapping app that tracked the location of 200 million smartphone users during the New Year period. The latest analysis of this data shows just how vast this mass migration is. For example, over 2 million people left the Guandong province of China and returned just a few days later--that's equivalent to the entire population of Chicago upping sticks. The work shows how easy it is to track the movement of large numbers of people with current technology--assuming they are willing to allow their data to be used in this way. jfruh writes: Last year, a bipartisan coalition helped get the Main Street Fairness Act approved by the U.S. Senate. The bill would have allowed state and local governments to collect sales taxes on Internet sales by companies in different jurisdictions. But House Speaker John Boehner, a longtime opponent of Internet taxes, won't bring the matter to a vote in the House before the end of the year, which should kill it for the immediate future. sciencehabit writes: Blind from infancy, Daniel Kish learned as a young boy to judge his height while climbing trees by making rapid clicking noises and listening for their echoes off the ground. No one taught him the technique, which is now recognized as a human form of echolocation. Like Kish, a handful of blind echolocators worldwide have taught themselves to use clicks and echoes to navigate their surroundings with impressive ease — Kish can even ride his bike down the street. A study of sighted people newly trained to echolocate now suggests that the secret to Kish's skill isn't just supersensitive ears. Instead, the entire body, neck, and head are key to 'seeing' with sound — an insight that could assist blind people learning the skill. samzenpus writes Rachel Sussman is a photographer whose work covers the junction of art, science, and philosophy. Perhaps her most famous work is the "Oldest Living Things in the World" project. Working with biologists, she traveled all over the world to find and photograph organisms that are 2,000 years old and older. Sussman gave a TED talk highlighting parts of the project including a clonal colony of quaking aspen 80,000-years-old and 2,000-year-old brain coral off Tobago's coast. Rachel has agreed to put down her camera and answer any questions you may have about photography or any of her projects. As usual, ask as many as you'd like, but please, one per post. The European Space Agency has confirmed that the Philae probe has successfully landed on the comet 67P/Churyumov–Gerasimenko and established contact with headquarters. The harpoons have deployed and reeled in the slack, and the landing gear has retracted. (Edit: They're now saying the harpoons didn't fire after all.) 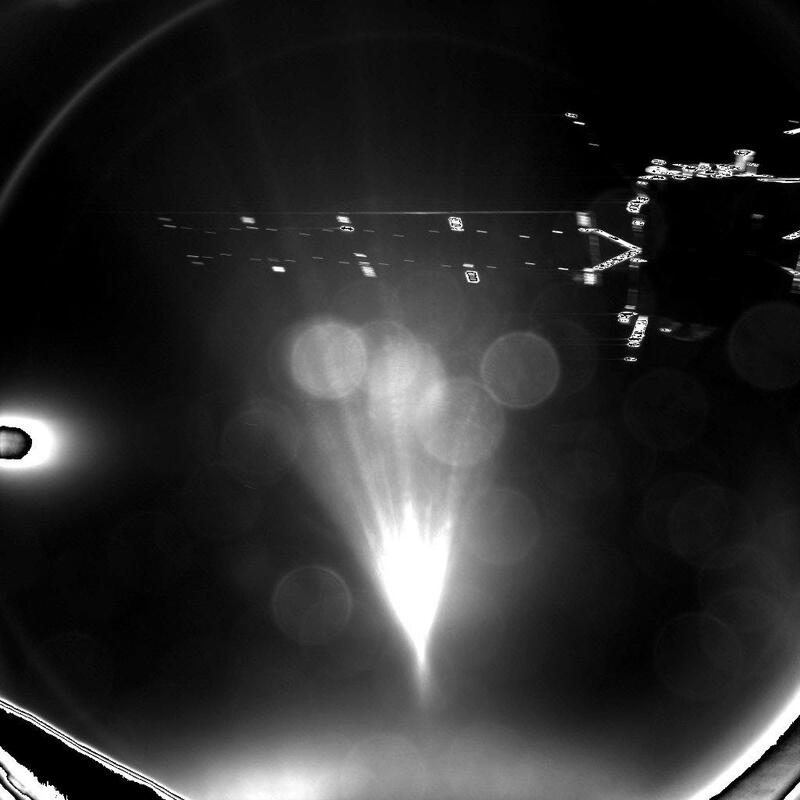 There are no photos from the surface yet, but the Rosetta probe snapped this picture of Philae after initial separation, and Philae took this picture of Rosetta. Emily Lakdawalla has a timeline of the operation (cached). She notes that there was a problem with the gas thruster mounted on top of the lander. The purpose of the thruster was to keep the lander on the comet after landing, since there was a very real possibility that it could bounce off. (The comet's local gravity is only about 10^-3 m/s^2.) The pins that were supposed to puncture the wax seal on the jet were unable to do so for reasons unknown. Still, the jet did not seem to be necessary. The official ESA Rosetta site will be continually updating as more data comes back. An anonymous reader writes: Microsoft today announced plans to open source .NET, the company's software framework that primarily runs on Windows, and release it on GitHub. Furthermore, Microsoft also unveiled plans to take .NET cross-platform by targeting both Mac OS X and Linux. In the next release, Microsoft plans to open source the entire .NET server stack, from ASP.NET 5 down to the Common Language Runtime and Base Class Libraries. The company will let developers build .NET cloud applications on multiple platforms; it is promising future support of the .NET Core server runtime and framework for Mac and Linux. Microsoft is also making Visual Studio free for small teams. An anonymous reader writes: A school in Methuen, Massachusetts has demonstrated the first installation of an automated detection system for active gunmen. Sensors placed throughout the building are activated by the sounds of gunfire. The sensors relay data on the shooter's real-time location directly to police, who can then track and subdue their target. The system was developed for the military to detect the location of enemy fire. It will cost school districts between $20,000 and $100,000 to equip each school with the gunfire-detecting sensors. Methuen's police chief said, "It's amazing, the short, split-second amount of time from identification of the shot to transmission of the message. It changes the whole game. Without that shot detection system, we wouldn't know what was going on in the school ... Valuable, valuable time can be lost. Unfortunately, with school crisis situations, it's about mitigating loss." theodp writes: The Duke Chronicle published an e-mail reportedly sent to hundreds of Duke students who took Computer Science 201 (Data Structures & Algorithms) last spring, giving those who copied solutions to class problems until Nov. 12th to turn themselves in for cheating. "Students who have violated course policies but do not step forward by November 12, 2014," warns the e-mail, "will not be offered faculty-student resolution and will be referred to the Office of Student Conduct for disciplinary processes without any recommendation for leniency." The Chronicle adds that CS Prof Owen Astrachan, co-director of undergraduate studies, admitted that there is a fine line between collaboration and cheating in computer science — online and in person, although Astrachan made it clear in comments that "Students who copied code from the Internet are in violation of the community standard and course policies." An anonymous reader writes: After extended talks on the issue of climate change, the U.S. and China have reached a landmark accord to curb emissions in the near future. The two countries are the top carbon polluters, so their actions are likely to have a major effect on world pollution levels and also set the standard for other countries. The agreement includes China's first-ever commitment to stop the growth of its emissions by 2030. They plan on shifting a big chunk of their energy production to renewables in that time. The U.S. agreed to emit 26-28% less carbon in 2025 than it did in 2005. Their efforts could spur greater enthusiasm for a new global climate agreement in 2015. Technology products look likely to gain more access to international markets as a result of upgrade between the U.S. and China on a 1996 tariff-eliminating trade agreement that President Obama announced Tuesday in Beijing. The agreement is expected to lower prices on a raft of new technology products by eliminating border tariffs — a price impact that's expected to be larger outside the United States, since U.S. tariffs on high-tech goods are generally lower than those overseas. "This is a win-win-win agreement for information and communication technology industries in the U.S., Europe, Japan and China, for businesses and consumers who purchase IT products and for the global economy." apexcp writes: A week ago, Silk Road 2.0 was theatrically shut down by a global cadre of law enforcement. This week, the dark net is realigning. "In the wake of the latest police action against online bazaars, the anonymous black market known as Evolution is now the biggest Dark Net market of all time. Today, Evolution features 20,221 products for sale, a 28.8 percent increase from just one month ago and an enormous 300 percent increase over the past six months." mpicpp sends news of research at the University of Michigan in which a self-assembling chain of particles can be used as tiny, electrically-activated muscles. The team started with particles similar to those found in paint, with diameters of about a hundredth the width of a strand of hair. They stretched these particles into football shapes and coated one side of each football with gold. The gilded halves attracted one another in slightly salty water—ideally about half the salt concentration in the sports drink Powerade. The more salt in the water, the stronger the attraction. Left to their own devices, the particles formed short chains of overlapping pairs, averaging around 50 or 60 particles to a chain. When exposed to an alternating electric field, the chains seemed to add new particles indefinitely. But the real excitement was in the way that the chains stretched. ... While the force generated by the fibers is about 1,000 times weaker than human muscle tissue per unit area, it may be enough for microbots. HughPickens.com writes Justin Gillis writes in the NYT that Denmark is pursuing the world's most ambitious policy against climate change, aiming to end the burning of fossil fuels in any form by 2050 — not just in electricity production, as some other countries hope to do, but in transportation as well. The trouble is that while renewable power sources like wind and solar cost nothing to run, once installed, as more of these types of power sources push their way onto the electric grid, they cause power prices to crash at what used to be the most profitable times of day. Conventional power plants, operating on gas or coal or uranium, are becoming uneconomical to run. Yet those plants are needed to supply backup power for times when the wind is not blowing and the sun is not shining. With their prime assets throwing off less cash, electricity suppliers in Germany and Denmark have applied to shut down a slew of newly unprofitable power plants, but nervous governments are resisting, afraid of being caught short on some cold winter's night with little wind. "We are really worried about this situation," says Anders Stouge, the deputy director general of the Danish Energy Association. "If we don't do something, we will in the future face higher and higher risks of blackouts." An anonymous reader writes: Drafts are drafts for a reason. Not only do they tend to contain unpolished writing and unfinished thoughts, they're often filled with little notes we leave ourselves to fill in later. Slate reports on a paper recently published in the journal Ethology that contained an unfortunate self-note that made it into the final, published article, despite layers upon layers of editing, peer review, and proofreading. In the middle of a sentence about shoaling preferences, the note asks, "should we cite the crappy Gabor paper here?" When notified of the mistake, the publisher quickly took it down and said they would "investigate" how the line wasn't caught. One of the authors said it wasn't intentional and apologized for the impolite error. Rambo Tribble writes: Groupon has announced it will abandon the 'Gnome' name for their product, ending the recent naming controversy that had the open source community up in arms. They said, "After additional conversations with the open source community and the Gnome Foundation, we have decided to abandon our pending trademark applications for 'Gnome.' We will choose a new name for our product going forward." The GNOME Foundation has thanked everyone who helped. My question... does this represent Gnu thinking on the part of Groupon?